Recently we had the privilege of shooting for SPORK, a new restaurant in North Dallas. Although Sojung and I have worked together on many shoots, this was our first time both photographing food and taking pictures together. I shot on my Fuji X-T1 camera and Sojung used the iPhone for their social media posts. The week before the shoot, we purchased a video course from Creative Live on how to style and photograph food. We grabbed a bag of chips and settled in to watch the videos together. 8 hours later, we were filled with information and ready to begin planning the shoot. I love learning new things, so photographing a new subject was a great opportunity for me. I’ve shot hundreds of people, but I didn’t realize how different it would be to photograph food and not skin. Greasy foods like cheese and fries absorb light much differently than skin. It is helpful to light food from the back instead of overhead or to the side like a typical headshot. Food is often shot with a back light because to show texture and volume; lighting from the front can make food look flat and unappetizing. However, I started the day feeling unprepared. I left my tethering cable at the studio, which meant that I was only able to view the images on the back of my camera instead of the computer. I was already out of my comfort zone, and I felt more anxious after forgetting something. Also, I wasn’t expecting the food to settle so quickly. Cheese, especially, melted quickly and soon looked like it had sat out for hours instead of 10 minutes. There was a salad we had to quickly but carefully layer with pickled radishes and beets so it didn’t look like a green muddle with toppings. Meanwhile more dishes were coming out of the kitchen. 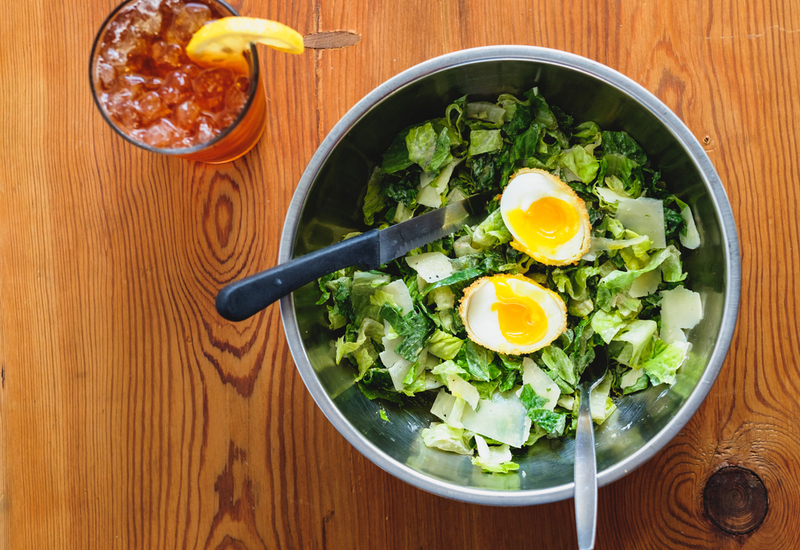 We worked fast with the Caesar salad and fried egg that still had a runny yolk. We couldn't have the yolk filming over! During this shoot, I learned that I really need to stick with my gut instinct. I was constantly thinking about the kinds of photos I was used to seeing in magazines and advertisements. I was tempted to copy other people’s styles without first thinking about what I wanted the shot to look like. When I stuck with my vision instead of only what I had seen other people do, the pictures turned out much better. Instead of shooting in the studio like I normally do, I used the natural light that spilled in from the floor-to-cieling windows of the restaurant. We used six different locations throughout the space for the fifteen dishes and five cocktails we photographed. The Grape Ape is a deliciously refreshing cocktail. It was interesting to photograph small objects instead of people. With people, I can take almost unlimited shots until I get the right one. But food and drink settle quickly, and I only have a few minutes for each dish. It was exhilarating to get out of my normal routine and rethink what I want photos to look like. Working quickly to get iPhone shots of the milkshake before the whipped cream melted away completely - we had to re-top it twice! Five hours and fifteen dishes later, both of us were worn out. But we enjoyed working together and learning so much. We also enjoyed all the food we ate throughout the day, especially the Flank Steak Sandwich and the Smoke Bacon Sandwich. Flank Steak Sandwich - The steak and the fried egg were perfectly cooked. We can’t wait to go back to SPORK again!